Ng Mui Si Tai (Wumei Shitai or “Five Plums Nun”), was said to have been a Buddhist Nun, that was a supporter of the Ming Royal Family. Ng Mui is also one the legendary Shaolin (Young Forest) Temple’s fabled “Five Ancestors”, who escaped the Fujian temple’s burning and destruction. She was said to be a master of “Weng Chun County Bok Hok Kuen” (Eternal Spring White Crane Boxing), and one of the most skilled, of the surviving “Five Ancestors”, and most attributed in the creation of Wing Chun Kuen. After escaping the Fujian Temples destruction, hunted by the Ching army, fleeing for her life, Ng Mui made her way to the Sichuan area, and the Emei Mountain range, taking refuge in the “Bok Hok Jee” (White Crane Temple). 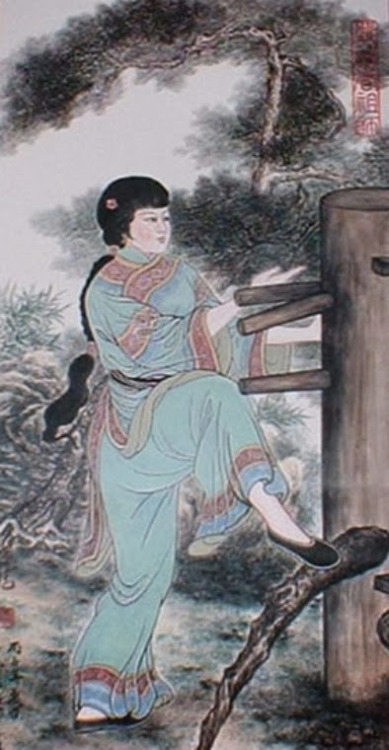 The true identity of Ng Mui, has been under debate, within Chinese Martial Art circles, for over two hunderd years.She was sometimes said to have been Lui Sei-Leung, the Forth Daughter of the Ming General, named Lui. Lui Sei-Leung was said to have attempted the assasination of the the Ching Emperor, using very advanced martial art skill.Some research suggests “Ng Mui” was a fictional cover for Chan Wing-Wah or a person nicknamed “White Crane Taoist”, who was a revolutionary from the 1670′s. It has also been suggested that “Ng Mui” and the traditional Yim Wing Chun story, was based on the Weng Chun County White Crane Oral tradition of Fang Qi Niang, the female practioner that founded the White Crane boxing system. It is possible that the oral tradition of Fang, was embeded in the Wing Chun Tradition, as a key, for opening the door, for the Wing Chun Clan, to trace the truth, of who their parent system really was. Modern research from the AWCKRI suggests “Ng Mui” was a 3rd,4th or most likly a 5th generation practioner, of Weng Chun County White Crane Fist. It is believed the version of White Crane that she practised was Pre-Pan Family(pre-1850) and maintained the older San Sik method of organization. Ng Mui evolved the system, with softer/Rou “Ging Faat”(energy/force expresion methods), than is typicaly found in the harder “Ging” methods still preserved by the Pan Gar, and it was this refined Crane system, she taught to Miu Shin, in the Guangxi area. It was then Miu Shin, that used Ng Mui’s Softened White Crane and combined it with his Internal Snake Boxing method, to create the earliest version of the Wing Chun Kuen System. The Term “Ng Mui” or 5 Plum’s, makes referance to the “Ng Dim Mui” or “5 Points Plum”, which is a a concept found in the Weng Chun County White Crane Fist system, which relates to a method of “Mah Faat” or Horse/Stance method, that is unique to the White Crane system, and was also passed down to the Wing Chun Kuen System. Most Branchs of Wing Chun Kuen, trace themselves to Ng Mui, in some form or another, except the so called “Shaolin Wing Chun”, “Chi Sim Weng Chun”, or Northern Wing Chun like “Pao Fa Lien” branchs. She is the root ancestor, most attributed, to the creation of the Wing Chun Kuen system, with Abbot Chi Sim following in second place as contributing the Look Dim Boon Gwun method and at times replacing Ng Mui as the root ancestor. Most beliefs about Ng Mui break down into two schools of belief as to her role in the Wing Chun Kuen creation traditions. In the first, she must be considered the founder who passed along a fairly complete system to Yim Wing Chun. In the second, she must be considered the primary source who passed down the raw materials, later shaped by Yim Wing Chun or Miu Shin, who later founded the art proper known as “Wing Chun Kuen”. Two popular folk stories say Ng Mui went to Yunnan’s White Crane Temple where one day she witnessed a fight between a fox and a white crane. The fox lost and Ng Mui used the crane as inspiration create a new style she named Bok Hok Kuen (White Crane Boxing). The other story relates that one day, Ng Mui’s practice was interrupted by a snake and a crane, locked in combat. Ng Mui watched the snake and the crane, and came to admire their fighting methods. Observing, Ng Mui began to incorporate the unique strengths and tactics into her already well developed martial skills, creating a remarkable new method. At this point the oral and written traditions of Yuen Kay Shan and Cho Family picks up where Ng Mui then journeyed to Guangxi where she met Miu Shin. She accepted Miu as a student, passing on to him, her refined boxing methods. Miu Shin than mixed Ng Mui’s Bak Hok Kuen, with the snake boxing methods he all ready practised, and created the style which would eventually be named Wing Chun, after Yim Yee’s daughter.